recommendations for yellow pigments for retouching... I have just used up the last of my trusty Indian yellow. The Windsor and Newton Indian yellow? thats indeed very unfortunate that they stopped production of dry pigments. Yes Windsor and Newton... such a shame! Or even the orasol dyes? Please test everything for lightfastness and fading. It's really frustrating when one does a retouching job which is initially superb, and looks like crap when it comes back in 6 months to 40 years later. Please test everything for lightfastness and fading. It's really frustrating when one does a retouching job which is initially superb, and looks like crap when it comes in 6 months to 40 years later. Yes in the tutti gialli formula both the aloe and tumeric are not that lightfast. Avoid outdoor gigs and direct sunlight. The gamboge is poisonous. Other than that it is great. This is from your mentor's book. And the sanders wood/dragons blood combination, which was used a lot when I first arrived at the Weisshaar shop, had huge issues too. I had a look at their online shop and their estimated shipping costs to the UK made my eyes water. "These are professional quality powder pigments, and are selected for purity, permanence, brilliance and working characteristics. All of these pure, very finely ground, light-proof dry colors mix easily with paints, varnish, lacquers, epoxy coatings and adhesives. " In my experience, the permanence of pigments and dyes can be highly dependent on what they are mixed with. Cornelissen's tartrazine yellow is, as w&n's Indian yellow was, tartrazine Lake. No need to look further if you want to keep using the same stuff. I do remember @Matthew Noykos Recommended the orasol dyes. Could you shine some light on your experience with them? Tartrazine, isn't that what Yellow No. 5 food dye is? Very much so. The medium is key. The yellow that I use is from Wood Finishing Enterprises' "light fast wood stain colors" series, #92-0130. I also use the red, blue and black from the same series. As for the WN Indian Yellow that was discontinued, what was the PY designation? Sorry I didn’t see this earlier. The Orasol dyes work very well. They are a professional dye like David was describing. They are also very lightfast. They have a lot of yellows and some of the yellows might not be what you would consider yellow. When I’m in the shop again on Tuesday, I can take a photo of a few of the yellow colors and I might have some more to discuss once they are in front of me. The biggest complaint I have from the orasol dyes is the intensity. You have to tone them down with something else like a lamp black to make them work well. It’s like anything else, you have to work with them for a little while to get the hang of it. Lately however I have been trying OldWood alcohol colors and I like them a lot. I have only been experimenting with them for a few months but so far so good. I usually use a glazing technique for touchup meaning I put the colors (orasol, OldWood, or dusted earthtone pigments) directly onto the piece without any medium and alternate layers of shellac to seal the color in. The OldWood alcohol colors have a nice flow off the brush that I appreciate and the colors seam easy to match. As far as lightfastness goes, I’m working on figuring that out. I have all the colors painted on a tile and taped to my cars dash. I also have another tile with the same colors on them sitting in a drawer and not exposed to light. I’ve been doing this for maybe 4 or 5 months so far. I’m going to continue through summer and then I will stop. So far the colors have held up pretty well, except the yellow actually gets slightly darker (I was expecting it to fade). I can post a picture of the 2 tiles on Tuesday too. Thanks for getting in touch Matthew! Is that a book? What't the title? 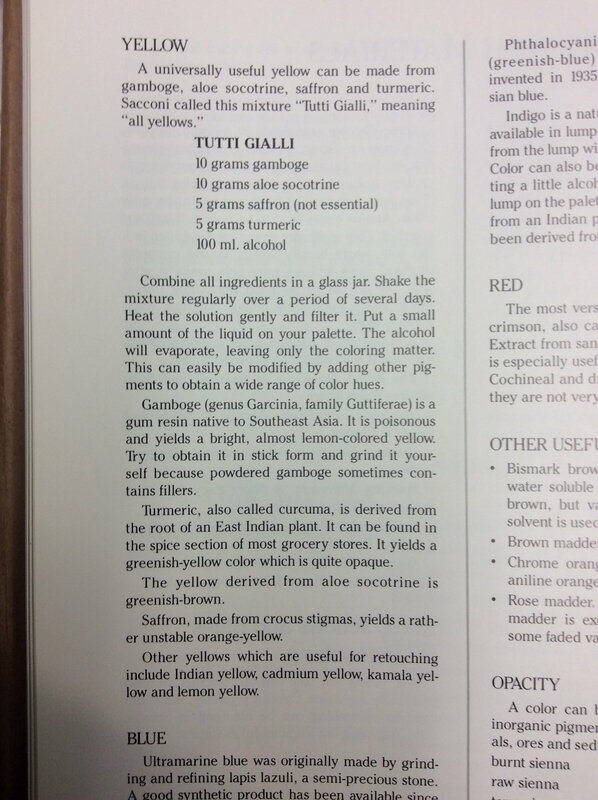 That Tutti Gialli recipe throws in every natural yellow pigment with fingers crossed hoping that one will not fade.
" But what shall we call it? I know, How about Tutti Gialli?" I've been using cadmium yellow, but I don't know if it will fade or not? It seems to look good in 19th century paintings. It supposedly appeared in 1820. Did Antonio use yellows? My guess is that sometimes he did, maybe? But what pigments, Naples yellow? Yellow ochres? Orpiment? Lead-Tin yellow? Are you asking about grounds or varnishes? Early on, he used umber as a ground just like Amati. Then, he switched to an organic plant, I believe. I am traveling and don't have my notes about varnish pigments.